I’m delighted to be joined by fellow Accent author, Jo Bartlett. Today, she is thinking Christmas. I wonder if you’ve got a picture already conjured up in your head when you read that title? Is your family Christmas like the squabbling brother and sister who eventually come good in the new M&S advert, or is the dog the number one priority in your house, as John Lewis depicts? Or perhaps it’s such a unique family dynamic that no advertiser has ever managed to represent a family like yours at Christmas. Growing up, there was plenty of squabbling in the house between me and my sister. Less than two years apart in age, we had a love/hate relationship and presents had to be duplicated to ensure that we didn’t come to blows over whose turn it was to give Tiny Tears her never ending bottle. Looking back it was a fairly traditional family set up, we had an older sister and brother who came home for Christmas too and extended family who we got together with over the festive season. Fast forward over thirty years and many families are scattered across wider geographical distances, and the ability to use technology to interact with friends and loved ones perhaps means we don’t make as much effort as we could to see people face to face. Perhaps the biggest change, though, is what family *looks* like. The days of a family simply equalling mum, dad and 2.4 children is as outdated as the Sodastream which made us feel so cutting edge back in those 1980s’ Christmases of my youth. I love exploring the dynamics of family life and the relationships which make a house a home, something that always seems to be a theme of my books. St Nicholas Bay is a fictional seaside town on the Kent coast, where rumour has it that Charles Dickens penned A Christmas Carol. 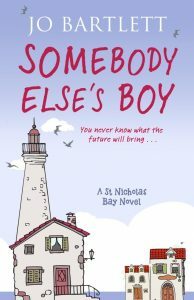 In ‘The Gift of Christmas Yet to Come’, which is set in St Nicholas Bay, the plot explores perhaps the greatest love story of all – adoption. It’s also about how the best of friends can become as close as family and that the family you end up with isn’t always the one you expect. The heroine’s journey to motherhood was partly inspired by a true story and the childhood friend to whom the book is dedicated. I’m part of a jigsaw family, as we’re called, made up of birth children and step-children and I truly wouldn’t want it any other way. 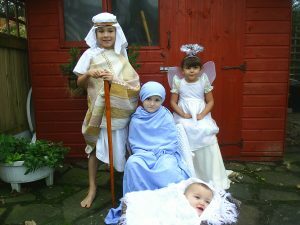 I’ve included a picture here from when my children were younger and I made them all pose like this for a family Christmas card – we laugh about it together now and they’ve forgiven me for being such an embarrassing mum and stepmum, like families do. Perhaps it’s this that draws me back to telling stories about families who might never feature in a Christmas advertisement, but who know that being a family is about so much more than genetics. However, you spend your Christmas this year, I hope it’s surrounded by the people you love – your family – whatever that might look like. 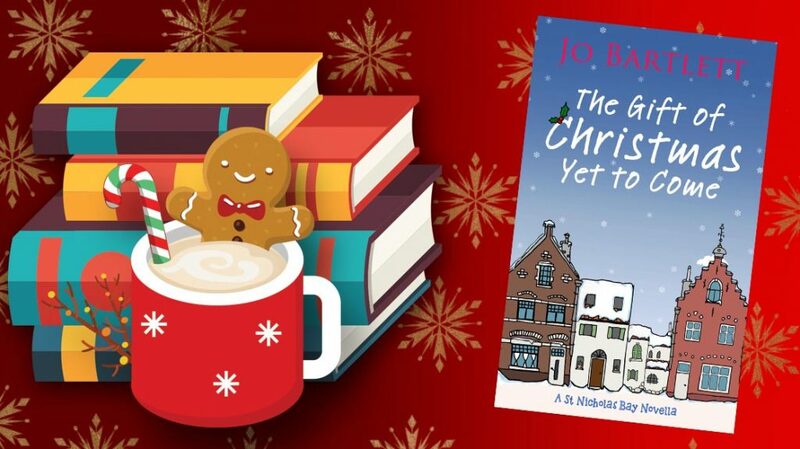 Jo Bartlett is an author and lecturer who lives with her husband and four children, in a part of Kent that’s so close to south east corner of England that they’re almost French. Thanks ever so much for such a great blog Jo. Thanks so much for stopping by and commenting 🙂 I love that picture of the kids too, but not sure they are that keen on me sharing it with the world!